Creating a masterplan to guide the current and future development of a charity's green belt HQ site near London. Queen Elizabeth’s Foundation is a charity which works to equip disabled people with skills to increase their independence and mobility, and help them into employment. QEF works with people living with physical and learning disabilities or acquired brain injuries to gain new skills and increase independence. 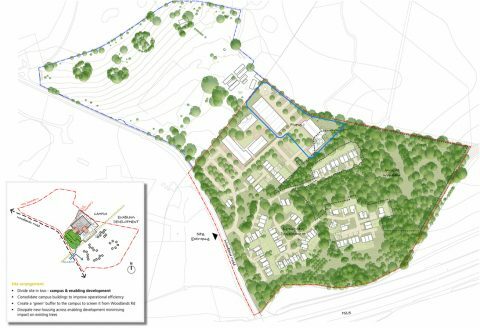 We have worked with the Foundation to create a comprehensive masterplan for the regeneration of their main training college campus in Surrey. The campus has developed over a long period, making use of existing buildings of disparate type and condition. The brief required a phased development to respond to funding streams and enable the college to continue operating with minimal disruption. The master plan aims to provide new residential, training, administrative and leisure facilities within a coherent setting.